Well, it's true. The subject of today's cheapo knockoff review is not a junior machinder or some other monstrosity from some weird part of the globe that no one knew made toys. Instead, I've got a bootleg toy from Italy called "Super Warrior" that is part Battle Fever and part Leopardon. I'm certainly not an expert of vintage Popy die-casts, but this appears to be a mash up of the GB-03 ST Battle Fever and the GA-89 ST Leopardon. They've drilled out a hole in the front of the legs and added a missile firing mechanism that was not present on the original toy. Pressing the little red button on the thighs fires a thin red missile. These same missiles can also be launched from the cannons attached to the lower legs. Unlike the Battle Fever toy, these launchers are always exposed and cannot be stored in the legs. Drag! Other differences from the original include new stickers on the legs. There is a strange thing about this toy concerning the fists and I'm not entirely sure if it's unique to my specimen or just an odd choice in design. Of the two pairs of fists, only one pair can actually lock into place in the arm. The other pair does not have the knub at the end that the release mechanism grabs onto. They don't appear to be broken. If they are broken, they managed to break at actually the same length without leaving any discernible damage. Another problem with this guy is that the is some serious flash that needs to be scraped off of the handle of the shield. As it stands now, you cannot even get the handle into the hole in the hand because there is so much excess plastic on it! The body of Leopardon doesn't appear to have been changed much with the exception of the new waist sticker that says simply "Super". I have to admit, to my eyes, the body and head of Leopardon don't look too bad here. If I were not familiar with either of the original robots, I probably wouldn't bat an eyelash when seeing this for the first time. Certainly, there have been far worse looking combinations. The plastic here is a bit cheap and the paint apps leave a bit to be desired, but on the whole, this toy isn't really that bad. It's certainly better than most of the bootleg machinders I've seen from Italy. 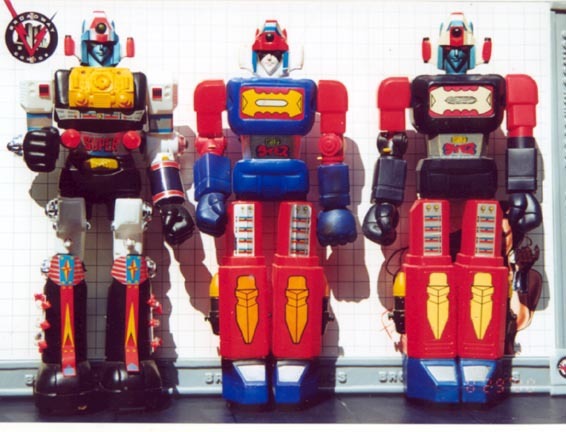 Speaking of which, Luca, the company that made this toy also made a Jumbo Super Warrior(far left), but that one was slightly different. Although it retains the legs of Battle Fever and the body of Leopardon, it also had the arms of Leopardon and the head of Daimos! For me, the worst part about this toy is that it's making me want more die-cast robots again! As you may know, I sold all that I had last year and I only have this since it was given to me. It's been standing on my desk for the last few weeks, a lonely gokin in a sea of vinyl. A bootleg that ADDS launchers? Nice. "For me, the worst part about this toy is that it's making me want more die-cast robots again! As you may know, I sold all that I had last year and I only have this since it was given to me. It's been standing on my desk for the last few weeks, a lonely gokin in a sea of vinyl." I think I like Leopardon more with this body. I had that! Bought it in Italy early 1980s. By then I had no idea what Leopaldon was. They also made a similar bootleg Battle Fever and a Daltanious ("Lion Robot" I think it was called, or was it "Lion Warrior"..? ), almost the same body but different stickers. I still have the "Daltanious", I have it next to my Popy. The quality is disastrous, but it looks quite cool somehow, the lion head has pupils and reminds me of small plastic toy animals of times long gone. Nice review and photos! Thanks! That would probably be "Lion Robot" or maybe even "Super Lion Robot". I don't pay much attention to die-casts, but I know there is a jumbo "Super Lion Robot" that is a Battle Fever/Daltanious hybrid. VERY rare though.. These bootleg reviews are when of the most enjoyable features of this site. When some new collectible SoC or vinyl figure comes out,I could google around and find several sites with pics or reviews,if I were so inclined. But only THIS site has this type of content,and that's why it's my favorite. I just noticed that the "Super Warrior" doesn't have the moveable red shoulder armors of Battle Fever. My "Super Lion Robot" has got them! Also, the mould of the body of the "Lion" is not the same as "Warrior". "Lion" is more Battle Fever-ish. But the leg stickers have the cross of Daltanious. I love the face on the box art, the 'Oh s**t!" look.